In that dank cavern down below Belgrave Square the walls were dripping. But what was that to the magician? It was secrecy that he needed, not dryness. 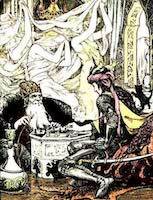 There he pondered upon the trend of events, shaped destinies and concocted magical brews. For the last few years the serenity of his ponderings had been disturbed by the noise of the motor-bus; while to his keen ears there came the earthquake-rumble, far off, of the train in the tube, going down Sloane Street; and when he heard of the world above his head was not to its credit. He decided one evening over his evil pipe, down there in his dank chamber, that London had lived long enough, had abused its opportunities, had gone too far, in fine, with its civilisation. And so he decided to wreck it. 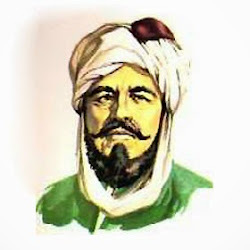 Therefore he beckoned up his acolyte from the weedy end of the cavern, and, "Bring me," he said, "the heart of the toad that dwelleth in Arabia and by the mountains of Bethany." The acolyte slipped away by the hidden door, leaving that grim old man with his frightful pipe, and whither he went who knows but the gipsy people, or by what path he returned; but within a year he stood in the cavern again, slipping secretly in by the trap while the old man smoked, and he brought with him a little fleshy thing that rotted in a casket of pure gold. "What is it?" the old man croaked. "It is," said the acolyte, "the heart of the toad that dwelt once in Arabia and by the mountains of Bethany." The old man's crooked fingers closed on it, and he blessed the acolyte with his rasping voice and claw-like hand uplifted; the motor-bus rumbled above on its endless journey; far off the train shook Sloane Street. "Come," said the old magician, "it is time." And there and then they left the weedy cavern, the acolyte carrying cauldron, gold poker and all things needful, and went abroad in the light. And very wonderful the old man looked in his silks. Their goal was the outskirts of London; the old man strode in front and the acolyte ran behind him, and there was something magical in the old man's stride alone, without his wonderful dress, the cauldron and wand, the hurrying acolyte and the small gold poker. Little boys jeered till they caught the old man's eye. So there went on through London this strange procession of two, too swift for any to follow. Things seemed worse up there than they did in the cavern, and the further they got on their way towards London's outskirts the worse London got. "It is time," said the old man, "surely." And so they came at last to London's edge and a small hill watching it with a mournful look. It was so mean that the acolyte longed for the cavern, dank though it was and full of terrible sayings that the old man said when he slept. They climbed the hill and put the cauldron down, and put there in the necessary things, and lit a fire of herbs that no chemist will sell nor decent gardener grow, and stirred the cauldron with the golden poker. The magician retired a little apart and muttered, then he strode back to the cauldron and, all being ready, suddenly opened the casket and let the fleshy thing fall in to boil. Then he made spells, then he flung up his arms; the fumes from the cauldron entering in at his mind he said raging things that he had not known before and runes that were dreadful (the acolyte screamed); there he cursed London from fog to loam-pit, from zenith to the abyss, motor-bus, factory, shop, parliament, people. "Let them all perish," he said, "and London pass away, tram lines and bricks and pavement, the usurpers too long of the fields, let them all pass away and the wild hares come back, blackberry and briar-rose." "Let it pass," he said, "pass now, pass utterly." In the momentary silence the old man coughed, then waited with eager eyes; and the long long hum of London hummed as it always has since first the reed-huts were set up by the river, changing its note at times but always humming, louder now than it was in years gone by, but humming night and day though its voice be cracked with age; so it hummed on. And the old man turned him round to his trembling acolyte and terribly said as he sank into the earth: "YOU HAVE NOT BROUGHT ME THE HEART OF THE TOAD THAT DWELLETH IN ARABIA NOR BY THE MOUNTAINS OF BETHANY!" To me, a middle-aged person who started purchasing Dungeons & Dragons Rulebooks forty years ago, the contemporary product offerings of Wizards of the Coast seem wildly overpriced. I bought the AD&D Players Handbook in 1978 for $9.95. By the end of the next year, I would own all three AD&D rulebooks, having paid a total of $31.85. At that time, the "whitebox" set of the original three "little brown books" was still being sold for $14.95. Just a few years before, it had retailed for $10.00 - a price that many contemporary reviewers thought was quite high for a mere game, especially one that did not contain a board or pieces. 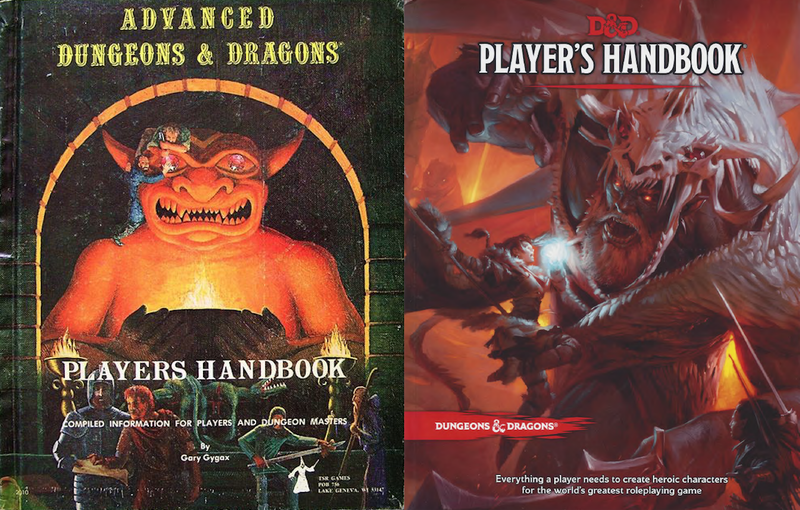 Today, the three D&D 5e "core" rulebooks sell for a combined list price of $149.85. Now of course I realize that there has been a fair amount of inflation since 1979 (or 1974, when the first edition of D&D hit the market), but has there been that much inflation? One wouldn't have thought so. In fact, prices have gone up by a factor of 5.3 since 1974, and by a factor of 3.2 since 1979. (That prices almost doubled in that five-year period, as seen from those numbers, shows that inflation was raging in the seventies.) See the CPI Inflation Calculator, here. I should note that merely adjusting for inflation doesn't give you the full story about people's purchasing power. Among other things, it doesn't look at how much money people actually have. One might assume that average wages and incomes have risen at least as fast as inflation over the last forty years, but that may not be the true for certain groups, including, arguably the sorts of groups - teenagers, students, younger wage earners, etc - who make up a large proportion of the RPG market. Still, adjusting for inflation is a good place to start. From this point on, when I talk of prices or use the terms expensive, inexpensive and so on, I will be referring to inflation-adjusted 2018 dollars. For the fun of it, I made a chart of some of the most well-known versions of D&D, with their original prices as well as their inflation-adjusted prices. As you can see, I also made a second chart featuring some of the "retro-clones." Which editions are or were actually the most (or least) expensive? Is 2018 a good time to be a D&D or RPG purchaser (in terms of prices) or were things better back in the day? In terms of its list price (3 x $49.95) D&D 5e is in fact the most expensive version of D&D ever published. Starting with AD&D in 1977-79, each successive hardcover edition would be a bit more expensive, culminating in D&D 5e, which cost almost 50% more than its first ancestor (going by its list price, at least). The original 1974 edition sold for less than half of the price of any of the successive five hardcover editions. However, if you add in the three supplements - Greyhawk, Blackmoor and Eldritch Wizardry - the prices are comparable. You can buy hardcover reprints of the original AD&D 1st edition volumes on DriveThruRPG for substantially less than they cost back in the day ($74.85 vs. $103.41). Not sure about the quality, but there it is. The above analysis changes somewhat if one looks at page and word counts. Of course, some would argue that more pages and words don't necessarily make a game product better - they might even make it worse. But for the sake of argument, let's assume they add value to the product at a constant rate. The original edition of Dungeons & Dragons may have been at the time, one of the longest game rulesets ever published, coming in at 45,000 words - almost certainly longer than the typical rulebook for, say, any of the Avalon Hill or SPI "monster" wargames of the period, and, I assume, judging from Chainmail, substantially longer than the typical set of miniatures rules. Five years later, the three AD&D game books would utterly crush that record, coming in at over a half-million words. I can't imagine how this wouldn't have meant that AD&D was by far the longest set of game rules published in the history of the world. Yet, oddly, as far as I can remember, few seemed to have remarked on this. Though role-playing was still new, and though the first AD&D rulebook - the 1977 Monster Manual - was stunning in its quality and scope, I don't remember anyone saying, "uh, guys, should anyone really be playing a game with a set of instructions 500,000 words long?" It seemed a completely natural and logical development, and is, of course, taken for granted now. But the more I think of it, the more I think this is extremely odd. With AD&D there was a massive leap in price to, I assume, near record levels for games. How many relatively self-contained games had ever cost more than $30? On the other hand, if looked at in terms of the number of words per dollar spent, AD&D constituted a massive leap in value - at least compared to earlier versions. You got six times the words for your dollar with AD&D than you got from the little brown books. The successive three-volume hardcover sets would all offer comparable word value - 4,000 - 6,000 words per dollar. However, the number of pages in each book took a large leap with 3rd edition (and the number of words per page dropped off somewhat proportionately). It looked like you were getting more content even though you weren't. Of course, if fewer words per page meant more pictures per page, one could argue that you were in fact getting more content. Words peaked at close to three-quarters of a million with edition 3.5. That's more words than are in the novel War and Peace. Curiously, edition 3.5 was the only multi-volume edition to feature three books containing exactly the same number of pages - 322 each, depending on how you count pages. 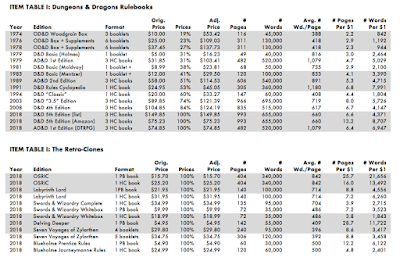 Not counting D&D 5e at the Amazon discounted price, the best value (in terms of words per dollar) of any D&D edition was the Rules Cyclopedia. For purposes of this analysis, I'm ignoring the fact that many of the clones are also available in free or extremely inexpensive PDF versions. All the retro-clones seem to offer good value compared with their D&D parents. Yet, for most of the clones, if value is expressed in terms of word count, their value is merely comparable with the various Wizards of the Coast "core" books, if even slightly less. Part of the philosophy of the clones is that less is in fact more. But still. In terms of pages and words per dollar, the incredibly massive OSRIC and the incredibly cheap Delving Deeper are the undisputed champions. Blueholme Prentice Rules also deserves a mention. The three members of the "100,000 word club" (at least on this chart) - Labyrinth Lord, Swords & Wizardry Complete and my own Seven Voyages of Zylarthen - are all roughly comparable in terms of overall price and words per dollar. (By the way, the words per dollar figure for the Labyrinth Lord hardcover edition, four rows down on the chart, is in error. Instead of "6,260" it should read, "3,130".) 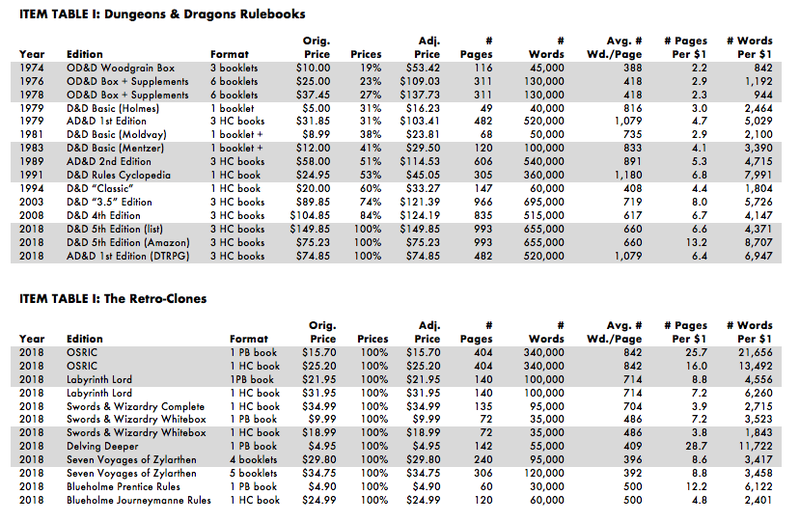 Much of the variance presumably reflects the different formats - hardcovers vs. paperbacks vs. booklets. Zylarthen's monster book contains 35% more words per page than its non-monster books (I think this is because its "stat blocs" are presented in prose as opposed to table form, and there are no other tables in the volume). I suspect Zylarthen is relatively unique in this as it is the reverse of the phenomenon you get in the five multi-volumes editions of AD&D and D&D where the monster books are often 35% or so less "meaty" - presumably due to having more pictures and stat blocs. You can't see this from the charts but I just thought it was a minor (obviously, very minor) weird and interesting fact. You can buy physical versions of the two relatively "straight" clones of the three little brown books - Swords & Wizardry Whitebox and Delving Deeper - for one-fifth and one-tenth, respectively, of what the three little brown books cost back in the day. Or, you can buy a PDF of the original Dungeons & Dragons whitebox itself for one-fifth of what you would have paid for its physical instantiation back in the day. Campion and Clitherow has (finally) bundled the physical instantiations and combined PDF of its classic OD&D "neo-clone" Seven Voyages of Zylarthen. The bundle includes the five physical booklets (the four original books plus the Book of Spells supplement) and the 337 page deluxe Electronic Edition, featuring an extensively bookmarked and hyperlinked PDF that includes all of the previous plus a printable Player Reference Sheets booklet. The bundle is priced at $34.75 on DriveThruRPG. Previous purchasers of the PDF alone will find they can purchase the bundle for $29.75, or $5.00 off the total price for the individual booklets. One of the reasons we're excited about this this is that we've noticed that most Zylarthen purchasers bought their booklets from Lulu but their PDF from DriveThru. Lulu prints great booklets, and I assume some people them during one of Lulu's periodic shipping sales. We wanted to create a way for DriveThruRPG people to get their own "permanent" advantage while creating a "one-stop" mechanism for new Zylarthen purchasers to get both the booklets and the PDF at a discount. For those unfamiliar with Seven Voyages of Zylarthen, the motivation was not to "clean up" or add "house-rules" to the original edition of the world's most popular role-playing game in the manner of, say, a straight retro-clone. There's nothing wrong with either of those programs, but they had already been done by, among others, Delving Deeper and Swords & Wizardry White Box. Rather, it was to identify the essential elements of the original game and, as it were, "turn them up to 11." And much of this had to do with tone and setting. As we remarked in the Introduction, "the brilliance and charm of earliest version of the original game was its simplicity and elegance, combined with a certain asymmetrical quirkiness. It invoked many sources—King Arthur, the Crusades, Middle-earth, the Arabian Nights, pulp fantasy, fairy tales, even science fiction. Its breadth of tone was a virtue, offering to the players a multiplicity of delights." Here are the gods and goddesses of myth, as well as the goblins and witches of Faery. And here also are the Martian races described by Burroughs, as well as the androids, cyborgs and robots of speculative fiction. 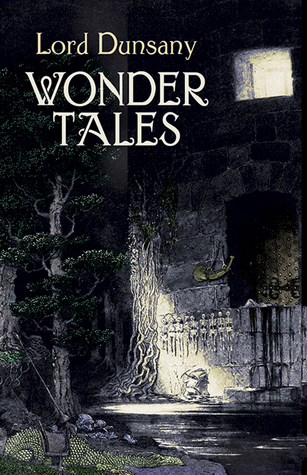 Here are treks through a fantastic wilderness or delvings into the deepest and most mysterious dungeons. Zylarthen is a game you can feel comfortable playing with your children. It is also a game for adults who wish to recapture the sense of wonder they had on first being introduced to the role-playing hobby. We hope that it will appeal to role-playing history wonks as well as younger enthusiasts who wish to get become more acquainted with, as it were, the roots of the thing. We hope you enjoy it! FBI Unabomber Investigation Report on Gary Gygax: "[Redacted] considers GYGAX to be eccentric and frightening. He is known to carry a weapon..."
Your Campaign Setting: Middle-Earth or Narnia? Save Versus All Wands Contest: What is the Value of the Coin Hoard? Amazing Transformations with I4 Oasis of the White Palm By Tracy Hickman, Laura Hickman, Philip Meyers, Peter L. Rice.